It’s amazing what can be the most attention grabbing artistic work in a collection. People joke about sculptures made from great heaps of rubbish, and paintings that are reminiscent of their 4-year-old niece’s artistic triumphs. But in this case, we see a quiet painting of a man who seems as if he isn’t even there, but which unobtrusively calls the eye. 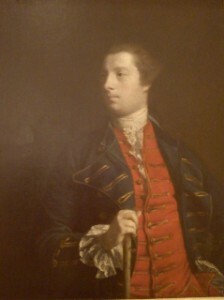 The Portrait of Aneas Mackay, of Ravenhead House in England in the late 1760s, by Joshua Reynolds, is nestled between several other paintings of the same era and style, against a dignified maroon wall at the Queensland Art Museum. It sits quietly, and patiently. Aesthetically, it does not seem to be in any way outstanding, but is a good portrait nonetheless. The gentleman is well dressed in a red waistcoat, a navy coat with gold braid and buttons, and an interesting lace trimmed shirt. He is holding a wooden cane, and appears to be aged anywhere between 25 and 40. His skin is smooth, and pale, and his grey and white flecked hair is styled in, presumably, the fashion of the time. Mr Mackay is captured by the artist looking to his right, out of the frame, his gaze and attention unfocused. In fact his presence seems merely physical, giving a strong impression that his mind and soul are elsewhere entirely. It begs the question, where, exactly are Mr Mackay’s thoughts? His face provides few clues. He is neither obviously happy nor sad or angry. His expression is almost blank. This, combined with his diverted gaze and the pale, smooth, waxy tone of his skin make him seem somewhat ghostlike. The illusion of transparency is enhanced by the lack of defined edges, failing to depict clearly where the dark background ends and the character begins. Observing the painting, there is a slight sense of sadness. The portrait captures the complete absence of joie de vivre, and its deficiency is melancholy. It is sometimes said that nature abhors a vaccuum, and this painting is the artistic equivalent. The complete lack of attention, focus and presence of the subject draws the viewer in. It is remarkable in its silence, communicating absence across the centuries. By that connection, it is a roaring success, for any artist that can portray such a human, and ever relatable quality as being disengaged from the world, across time and space, is surely a master.